Yesterday, on World Down Syndrome Day, the Prospector Theater saluted their Prospects with Down syndrome as well as those committed to its cause. 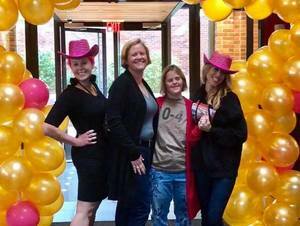 "We also want to send a big "sparkle on" to our friends at Massachusetts Institute of Technology (MIT) and the Alana Foundation for announcing the creation of a $30 million center to study Down syndrome! Woohoo!" Valerie Jensen, the Theater's founder said. Jensen, whose sister Hope was born with Down syndrome, shared some heartfelt and powerful words about her sister and the DS community in a blog she titled Hope for Hope’s Hope: This Is Not a Cure Song. It's worth more than a read, don't skim this. Share it. In the blog post, Val steps back in time, reminiscing about what it was like growing up in a busy household with her sister Hope. She imagines how Hope likely felt when she and her sisters when off to college while Hope stayed home. She writes, "Everything I thought I knew about Hope’s self-confidence and self-identity was now in question. She always made it loud and clear that she did not like Down syndrome, and she screamed every time she heard the word. But she had a happy life and… wait… her sisters all started driving, packed up, and left home…was her life happy? Did she like who she was? Gulp… would she wish for a cure?" Val took it upon herself to make a better life for Hope and for all adults who live with disabilities. Hope is among 70% of the Prospector's workforce who self-identify with a disability. These passionate, hardworking Prospects no longer stay home. They get up in the morning, and heads to work - to a first-run movie theater, with a backdrop of sparkle and hot pink, in the heart of Ridgefield, Connecticut. They make a difference and earns a paycheck. Val says, "The Prospector Theater was built for meaningful employment. Every day we help people with and without disabilities to build professional successes and strategies to fly. I’ve known that meaningful work gives me hope for Hope, and with the new center from MIT, that’s giving me hope for hope for Hope – or H3, like a triplicate chromosome, where all the sparkle lives, on this day March 21st, 2019." And, more "hope for Hope" came yesterday when the Massachusetts Institute of Technology (MIT) announced the creation of a $30 million center to study Down syndrome. I translate this to mean “hope for Hope.” I don’t want to lose Hope at 60. Read Val's blog post in its entirety here.